Ramp up print and cut productivity with a Mimaki! 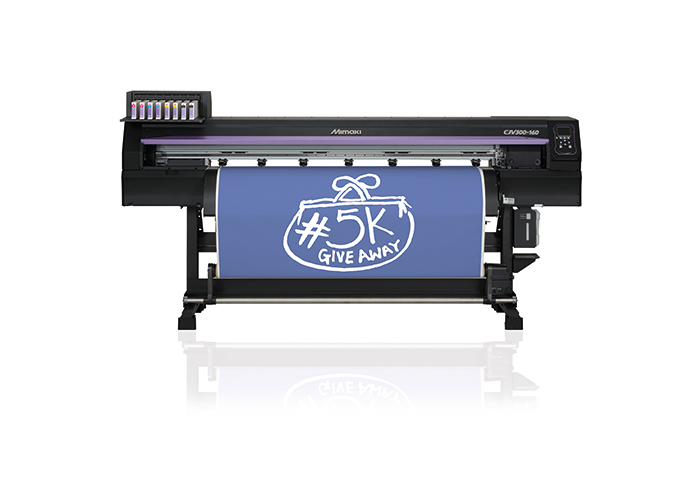 Companies looking to ramp up their print and cut productivity this summer have a great opportunity to acquire Mimaki’s flagship integrated printer/cutter,the CJV300 Series, which forms an integral part of the company’s Great £5k Print & Cut Giveaway. With up to £5,000 cashback available for businesses trading in their existing printer/cutter and a two year Gold warranty available as standard on the CJV300 Series, an investment in the multi award-winning solution makes for a strong business case. Mimaki’s CJV300 Series comprises a 1.3m and 1.6m model with print speeds of up to 105.9sq m/hour and powerful fully automated print and cut functionality. With over 3.5 litres of SS21 solvent ink included alongside a powered take-up unit and a professional suite of RIP and cutting software, the CJV300 is a class leading integrated printer/cutter and, according to John de la Roche, National Sales Manager – Signs and Graphics at Mimaki’s exclusive UK and Irish distributor, Hybrid Services, the offer represents an enticing proposition. Trade-in printer/cutters will be collected as the new machine is delivered and cashback of £4,000 for the CJV300-130 and £5,000 for the CJV300-160 will be paid by Hybrid directly to the customer after installation. The offer ends on 30th September 2015 and is available only through Hybrid’s reseller network. For further details and full terms and conditions, visit: www.hybridservices.co.uk or contacting an authorised Hybrid Services reseller.